After 47 years of attending the International CES, I am proud to say that the product a client of mine is showing has perhaps the biggest wow factor of the show. Picture a tablet on steroids. 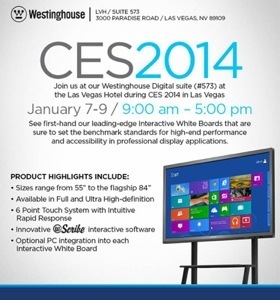 The Westinghouse Interactive Whiteboard will be used by anyone who is in the presentation business. It will be available in screen sizes from 55-inch to 84-inch. To view the full capabilities of the digital whiteboard, check out this video. This unit is not a consumer product. Schools, training, and medical are the target audiences. Back in the day, presenters used a chalk board to demonstrate. Today, everything is digital and interactive. Enjoy considering the possibilities.